I bade the Minister good morning, and took my departure at once, leaving a gold snuff-box upon the table. "The next morning I called for the snuff-box, when we resumed, quite eagerly, the conversation of the preceding day. While thus engaged, however, a loud report, as if of a pistol, was heard immediately beneath the windows of the hotel, and was succeeded by a series of fearful screams, and the shoutings of a terrified mob. D-- rushed to a casement, threw it open, and looked out. In the meantime, I stepped to the card-rack took the letter, put it in my pocket, and replaced it by a fac-simile, (so far as regards externals,) which I had carefully prepared at my lodgings - imitating the D-- cipher, very readily, by means of a seal formed of bread. "The disturbance in the street had been occasioned by the frantic behavior of a man with a musket. He had fired it among a crowd of women and children. It proved, however, to have been without ball, and the fellow was suffered to go his way as a lunatic or a drunkard. When he had gone, D-- came from the window, whither I had followed him immediately upon securing the object in view. Soon afterwards I bade him farewell. The pretended lunatic was a man in my own pay." "And when I raise my hand--so--you will throw into the room what I give you to throw, and will, at the same time, raise the cry of fire. You quite follow me?" "It is nothing very formidable," he said, taking a long cigar- shaped roll from his pocket. "It is an ordinary plumber's smoke- rocket, fitted with a cap at either end to make it self-lighting. Your task is confined to that. When you raise your cry of fire, it will be taken up by quite a number of people. You may then walk to the end of the street, and I will rejoin you in ten minutes. I hope that I have made myself clear?" Lestrade's face had begun to grow red and angry. "I don't know whether you are playing a game with us, Mr. Sherlock Holmes," said he. "If you know anything, you can surely say it without all this tomfoolery." "I assure you, my good Lestrade, that I have an excellent reason for everything that I do. You may possibly remember that you chaffed me a little, some hours ago, when the sun seemed on your side of the hedge, so you must not grudge me a little pomp and ceremony now. Might I ask you, Watson, to open that window, and then to put a match to the edge of the straw?" "Now we must see if we can find this witness for you, Lestrade. Might I ask you all to join in the cry of 'Fire!'? Now then; one, two, three----"
"Thank you. I will trouble you once again." "Just once more, gentlemen, and all together." "Fire!" The shout must have rung over Norwood. "Capital!" said Holmes, calmly. "Watson, a bucket of water over the straw. That will do! Lestrade, allow me to present you with your principal missing witness...."
In "A Scandal in Bohemia," Holmes attempts to retrieve a photograph for his client, The King of Bohemia. When Doyle created the following scene, he avoided merely duplicating the incident verbatim from Poe. 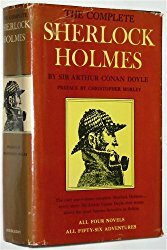 Rather than have Holmes take a coveted item and replace it with a facsimile (as Dupin does in "The Purloined Letter"), Holmes merely wanted to know where it was so he could return later and retrieve it. "Is there any other point to which you would wish to draw my attention?" "You're too late. She's my wife." "How did you know all that, Mr. Holmes?" "That is what you may expect to see when I follow you." It was not that he felt any emotion akin to love for Irene Adler. All emotions, and that one particularly, were abhorrent to his cold, precise but admirably balanced mind. He was, I take it, the most perfect reasoning and observing machine that the world has seen, but as a lover he would have placed himself in a false position. But contrast Watson's perception of Holmes with Holmes's own words. Holmes himself says of Irene Adler, "She is the daintiest thing under a bonnet on this planet." He tells Watson, "I only caught a glimpse of her at the moment, but she was a lovely woman, with a face that a man might die for." "He said that you could solve anything." "That you are never beaten." "I have been beaten four times--three times by men, and once by a woman." 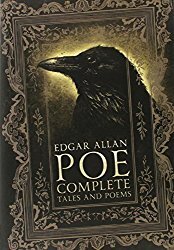 Even the language and some of the phrases that Poe used have been picked up by Doyle. For example, in "The Purloined Letter," Dupin's client explains about the culprit (the Minister D___): "He has been twice waylaid, as if by footpads, and his person rigorously searched under my own inspection" (emphasis mine). "I am perfectly willing to take advice, and to pay for it. I would really give fifty thousand francs to any one who would aid me in the matter." "'In that case,' replied Dupin, opening a drawer, and producing a check-book, you may as well fill me up a check for the amount mentioned. When you have signed it, I will hand you the letters.'" I was astounded. The Prefect appeared absolutely thunder-stricken. For some minutes he remained speechless and motionless, looking incredulously at my friend with open mouth, and eyes that seemed starting from their sockets; then, apparently recovering himself in some measure, he seized a pen, and after several pauses and vacant stares, finally filled up and signed a check for fifty thousand francs, and handed it across the table to Dupin. The latter examined it carefully and deposited it in his pocket-book; then, unlocking an escritoire, took thence a letter and gave it to the Prefect. This functionary grasped it in a perfect agony of joy, opened it with a trembling hand, cast a rapid glance at its contents, and then, scrambling and struggling to the door, rushed at length unceremoniously from the room and from the house, without having uttered a syllable since Dupin had requested him to fill up the check. "The fact is, your Grace," said he, "that my colleague, Dr. Watson, and myself had an assurance from Dr. Huxtable that a reward had been offered in this case. I should like to have this confirmed from your own lips." "It amounted, if I am correctly informed, to five thousand pounds to anyone who will tell you where your son is?" "And another thousand to the man who will name the person or persons who keep him in custody?" "Under the latter heading is included, no doubt, not only those who may have taken him away, but also those who conspire to keep him in his present position?" "Yes, yes," cried the Duke, impatiently. "If you do your work well, Mr. Sherlock Holmes, you will have no reason to complain of niggardly treatment." My friend rubbed his thin hands together with an appearance of avidity which was a surprise to me, who knew his frugal tastes. "I fancy that I see your Grace's check-book upon the table," said he. "I should be glad if you would make me out a check for six thousand pounds. It would be as well, perhaps, for you to cross it. The Capital and Counties Bank, Oxford Street branch are my agents." His Grace sat very stern and upright in his chair and looked stonily at my friend. "Is this a joke, Mr. Holmes? It is hardly a subject for pleasantry." "Not at all, your Grace. I was never more earnest in my life." "What do you mean, then?" "I mean that I have earned the reward. I know where your son is, and I know some, at least, of those who are holding him." The Duke's beard had turned more aggressively red than ever against his ghastly white face. The Duke took a pen in his quivering fingers and opened his check-book. "I shall be as good as my word, Mr. Holmes. I am about to write your check, however unwelcome the information which you have gained may be to me. When the offer was first made, I little thought the turn which events might take. But you and your friend are men of discretion, Mr. Holmes?" "Thank you," said he, as he replaced the glass. "It is the second most interesting object that I have seen in the North." Holmes folded up his check and placed it carefully in his notebook. "I am a poor man," said he, as he patted it affectionately, and thrust it into the depths of his inner pocket. On occasion, it appears that Doyle even picked up specific words or phrases (for example, recherche and outre) from Poe. Poe introduced an exotic animal as the "murderer" in one of his stories. Doyle made a horse the murderer in "Silver Blaze" and he used exotic animals in "The Speckled Band" (which Holmes calls "the deadliest snake in India"). Other Doyle stories that employ animals include "The Copper Beeches" and The Hound of the Baskervilles. Poe's story "The Gold Bug" has to do with ciphers. Doyle included ciphers in stories such as "The Dancing Men" and The Valley of Fear. In "The Gold Bug," Poe wrote, "...it may well be doubted whether human ingenuity can construct an enigma of the kind which human ingenuity may not, by proper application, resolve" (Tales). Compare this statement with Holmes's statement to Abe Slaney in "The Dancing Men": "What one man can invent another can discover." But Poe was not the only writer to have had a great influence on Doyle. I shall explore the influence that Emile Gaboriau made upon Doyle elsewhere on this website. Note: This article was continued from "Edgar Allan Poe's Influence on Sir Arthur Conan Doyle: Part 1."